PJ Harvey is the girlfriend you’d like to have but were too afraid your Mom would find out about. Which along with that great presence and voice is part of the appeal. As an artist who tries not to repeat herself, (with the exception for songs about blood…) she had been largely successful. Uh huh Her fell short, but seeming to recognize that, she made a giant leap with White Chalk : an introspective record that ditches guitars for piano, and her full chest voice for a fragile head voice. 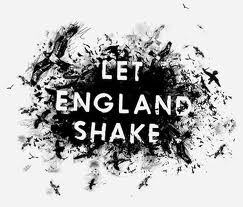 With Let England Shake, guitars return to some tracks (but not much of the distorted chugging guitars of old) , trumpets and key changes (The Words That Maketh Murder), weird samples (Written On The Forehead) are incorporated into the mix,the songs are upbeat and gorgeous, giving the ‘blood’ songs a whole new sound not heard on Harvey’s past efforts. It’s a richly inventive album and her best to date.